The world around us is an amazing place full of all sorts of wonders. The places you are about to see are like a bomb of bright colors and magnificent scenery that you just have to experience in person. I hope you enjoy these images. If you ever have a chance to travel to the valley of flowers in India you will be in for a beautiful sight. The vast array of different flowers is what gives this valley nestled in the western Himalayas its name. You can also find several rare or endangered animals here from snow leopards to musk deer. The park is over 2 km wide and 8 km long so it's not likely you will run out of places to explore there. If you ever travel to Chichibu Japan, you must visit Hitsujiyama Park. The park is open all year long but if you visit during the spring (from April to May) you will be bombarded by a sea of pink and lavender as the Shibazakura flowers will be in full bloom. These flowers, also known as Moss Pink flowers, only bloom during this time of year. Fly Geyser is located on a private ranch owned by the Burning Man Project in Nevada. The colorful geyser was actually created by accident in 1964 when people drilling a well didn't cap it correctly leading to the colorful mound you see today. The mound is still growing thanks to the minerals that are constantly accumulating around it from the geyser sprays. The geyser regularly releases water to a height of about 5 feet. The bright colors you see are due to the various minerals and algae. 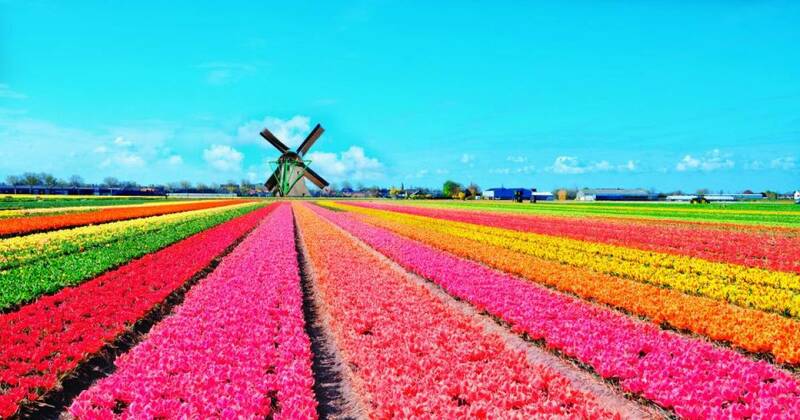 If you love tulips you should take a trip to the Netherlands during tulip season which lasts from March until well into May. Keukenhof located in Lisse, Holland is the biggest exhibition of flowers in the world and if you visit during the middle of April you will be bombarded by millions of bright colorful tulips. Take a trip to Yellowstone National Park to see the largest hot spring in America. The Grand Prismatic Spring is the 3rd biggest hot spring in the world and can be found in the Midway Geyser Basin. The amazing colors that you see here are caused by various microbes located in the water which is also full of minerals. Depending on the time of year the colors can differ with more reds and oranges seen in the summer and more greens and blues seen in the winter. Because of how hot, deep and sterile the center of the pool is, the water here is always a very deep blue. The Wisteria garden located in Kitakyushu Japan is truly a beautiful site. The private garden was opened in 1977 and is only open to the public during wisteria season and during the initial color changes of autumn. If you ever visit here you absolutely must take a stroll through the Wisteria tunnel that explodes with color. The best time to visit is from the middle of April to Early May. Located in China, the canola fields of Luoping County create a sea of gold for all to see. The beautiful golden flowers bloom in spring and last until the end of June.